The below artworks are the most important by Robert Indiana - that both overview the major creative periods, and highlight the greatest achievements by the artist. Artwork description & Analysis: Hole (1960) is a free-standing sculpture composed of a wooden rectangular column measuring almost four feet tall; near the base protrudes a wooden rod, while iron wheels are attached on both the right and left face of the column, at the same height. Two arrows, one in red and one in yellow, draw the viewer's eye to a small indented hole found near the top of the work, below which the word "HOLE" appears in black letters on a yellow stripe. The work is one of a series of wooden sculptures Indiana made shortly after his move to Coenties Slip in lower Manhattan. Located along the East River, the area was home to shipyards and abandoned warehouses, which provided a wealth of discarded objects such as the scraps of wood and metal that the artist assembled to create work such as this. Indiana called these sculptures "herms," having drawn inspiration from ancient Greek pillars used to mark intersections and roads that featured the head of the mythological god Hermes. Although we often consider Indiana's work in relation to Pop art because of its use of commercial and readymade materials, the herms are most akin to the combines of his neighbor and contemporary Robert Rauschenberg, a Neo-Dada artist; both used similar refuse materials to create hybrid sculptures. Importantly, the "herms" mark Indiana's first use of words in his art; as this would become an important theme in his oeuvre. 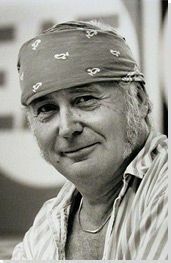 While some Pop artists used words to mimic commercial products or popular culture, as an amateur poet, Indiana's interest in literature often makes literary references in his use of language. In this work, "Hole" is the name of a town, a destination for a father and son bicycle ride in Samuel Beckett's Molloy. Many of Indiana's herms weave together layers of potential meaning, bringing together classical, modern, and humorous references; in doing so, he creates a dialogue between popular, contemporary culture and the high culture of traditional, even classical, art. Commonplace materials and language are transformed to be new vehicles for the continuation of art history. In this piece, the wheels (which he included in many of the herms) suggest not just the bicycle wheels of Beckett's story, but also serve as metaphorical representations of the god's winged sandals, while the protruding wooden peg makes an almost comical reference to male genitalia. Artwork description & Analysis: The American Dream I (1961) features four circles depicted in two rows of two. Each circle contains stars, along with text, numbers, or a combination of the two, all common elements in Indiana's paintings. Also characteristic is his use of stencils to create text and numbers in bold, vivid colors. Like Jasper Johns's target paintings, Indiana uses repeated simple and familiar geometric shapes to build a striking composition that reads as quickly and easily as a billboard, yet contains layers of symbolism and meaning. The first in a series of "American Dream" paintings, Indiana uses words that simultaneously reference both American life and his own biography. The recurring circle and star shapes are drawn from street and advertising signs, which Indiana used to make visual references to his childhood experiences of life on the road and also a larger commentary on the transitory nature of a life spent in search of the elusive "American dream." Indiana's references are both deeply personal and universal, merging his life experiences with common stereotypes of American culture to create a network of meanings. The numbers in the top left circle refer to United States Routes he had personally traveled, including the infamous Route 66. Yet this is no simple celebration of the American road, but a darker exploration of ambition and potential failure. The word "TILT" in the bottom left circle suggests the pinball machines commonly found in bars and diners which he considered to be alternate homes for many Americans, but were also places where he spent much of his childhood (especially after his mother worked in a diner to support her family). Yet "TILT" has an air of injustice, the signal lighting up when the game suspects the player of taking an unfair advantage; whether the game is right or wrong, the player's turn is disqualified. "TAKE ALL," featured in the top right circle, could refer to the typically American notion of trying to have everything, but also suggests a one-sidedness; only one person can take all, leaving others depleted. The simplicity can sound like a boast or ring out like a childish refrain. The "American Dream" is a complicated and often tragic ideal. While this series was begun early in Indiana's career, he returned to it and created the most recent, the ninth, in 2001. The American Dream I, however, is perhaps the most significant of the series as it helped to launch the artist's career: when Alfred Barr, then director of the Museum of Modern Art in New York, saw the work on display at the David Anderson Gallery in 1961, he immediately purchased it for the museum's collection. Artwork description & Analysis: As reflected in the title, The Green Diamond Eat/The Red Diamond Die is a 1962 work consisting of two painted diamond-shaped panels intended to be hung side-by-side. In the first, a red circle containing the word "EAT" in green lettering is placed on a green background. The second panel depicts a black circle with the word "DIE" in yellow letters placed on a red background. Words factor heavily in Indiana's work; beginning early in his career, he used individual three and four letter words to make powerful statements. His imperatives here are direct commands to the viewer, although they instruct us to execute natural and necessary actions. The choices of circle and diamond shapes were partially a matter of practicality, since a circle fits nicely within a square or diamond. The circle also provides a visually pleasing shape on which to place text, either simple words of a few letters as seen here, or longer words positioned around the curve of the circle as found in other works. The simplicity of these forms borrows from principles of graphic design to create easily-deciphered icons that the viewer can understand at a glance. This simplicity, however, is complicated in a fuller reading of the work; as is often the case, the painting's components are derived from autobiographical elements of Indiana's life. The red and green on the first canvas refer to his father, who worked for the Phillips 66 gas company and whose sign used those two colors for many years. When his father left the family, his mother worked in Diners, suggested by the word "EAT." Furthermore, "DIE" is linked to "EAT" for Indiana, since the last thing his mother told him before her death was to be sure to eat. The two panels create a representation of his parents, labeled with words that were linked to their absence from his life. He takes the language and visual iconography of mass media and marketing and transforms it into something meaningful and mournful, creating a connection between his individual experience and the anonymous everyman. Artwork description & Analysis: Robert Indiana's The Demuth American Dream #5 (1963) consists of five square panels displayed in a cross shape. Each panel features a red star, inscribed within black-ringed circle on a gray background. The stars are decorated with the number five, painted in gold and repeated in three sizes that appear to recede into the distance. Each circle is ringed with text, although these stenciled words differ: "DIE" on the top panel, "HUG" on the bottom, "ERR" on the left, and "EAT" on the right. In the central panel we read "AMERICAN DREAM" and the dates "1928" and "1963." Each phrase calls to mind some association, whether it is warm and maternal or dark and reproaching, yet Indiana also used this text to build a web of associations to pay tribute to the American modernist painter, Charles Demuth. This painting, one of five in a series created to honor Demuth, was inspired by one of Indiana's favorite works by that artist, The Figure Five in Gold (1928). A masterpiece of early-20th-century art, Demuth's Precisionist painting was, in turn, a portrait of the poet William Carlos Williams. Like Indiana's homage, Demuth's original painting embedded text within a hard-edge, abstract composition dominated by the number five, creating a series of cryptic references to its subject. 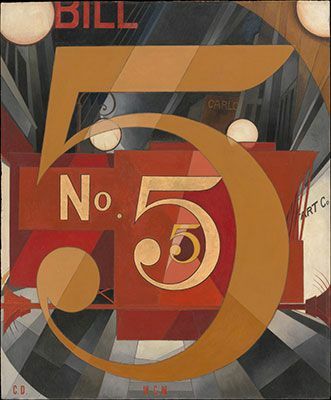 The dominant figure in Demuth's version, the repeated golden number five was a quotation from one of Williams's poems, "I saw the figure five in gold," about a fire truck speeding through a dark night. Highlighting their shared fascination with combining text and image, Demuth creates the three fives of decreasing size to evoke the sound of the fire truck as it races past; Indiana doubles that numeric reference with his five-panel composition and the repetition of the single words on the four outer panels. The connection between these paintings is further established by the dates "1928-1963," which relate the date of Demuth's creation and Indiana's homage. Both Indiana and Demuth played with ideas of American identity, creating works that seemed to simultaneously celebrate and question the "American dream" of the modern age. Like Demuth's transformation of industrial buildings into timeless monuments, Indiana draws from popular references to make work that builds upon a trajectory of fine art by referencing its past. This series demonstrates the importance that he placed on honoring the work of earlier artists who paved the way for future generations. Indiana, would return to this idea of tribute in 1990 with a series of paintings dedicated to Demuth's contemporary, the artist Marsden Hartley. Artwork description & Analysis: The Confederacy: Alabama (1965) is part of Robert Indiana's "Confederacy Series," a group of works depicting the states that seceded from the United States during the Civil War. Typical of many of his works, we see a geometrically based composition, with a series of concentric circles that call to mind a target. At the center, we see a brightly colored outline of the state's silhouette, decorated with a grouping of stars, one of which is labeled "Selma." We also find Indiana using a stenciled text label, "Alabama," at the bottom of the canvas and within the two rings reads the sentence, "Just as in the anatomy of man, every nation must have its hind part." The implication is clear and critical. Deeply troubled by rampant discrimination and acts of violence perpetrated against those engaged in the struggle for racial equality, Indiana links the present politics of Alabama with its secessionist past. Painted in the centennial anniversary of end of the Civil War and referring to the confederacy in the title, he draws a connection between the current, violent resistance to the Civil Rights movement and its history of violence, oppression, and slavery. In each painting of this series, Alabama, Florida, Mississippi, and Louisiana are marked as continued sites of racial injustice. Formally, the stars expand on the target composition; thematically they mark places of riot or protest. In this example, Indiana highlights Selma, notorious for "Bloody Sunday" and its opposition to federal attempts to end segregation. A man with a strong sense of political and social justice, this series was intended to be a direct and public condemnation. Using bold, simple colors, shapes, and words, Indiana creates a graphic and easily-understood statement in support of equality. Artwork description & Analysis: Perhaps Indiana's best known image, this version of LOVE is a large-scale sculpture, measuring twelve feet high, installed in midtown Manhattan. A simple, bold graphic, the word "LOVE" is stacked in two rows with "L" and "O" placed on top of "V" and "E." The jaunty angle of the "O" creates a playful break from the grid, complimented by the primary colors of paint that cover its surface. The use of red for the exterior facets of the letters and blue for interior spaces create a highly visible and easily legible arrangement. Indiana began exploring this "LOVE" theme in the 1960s, working first on canvas and then in sculptural form. He chose this word for its meaning, informed personally by his childhood experiences with Christian Science, and also for the symmetry and balance possible in this grid format. In stacking the letters to form a cohesive block, Indiana riffs on the monolithic coldness and silence of contemporary Minimalists with a brightly colored and cheerful statement. Whether one interprets "LOVE" as a verb, a noun, or an imperative command, there is no ambiguity in its meaning. This simplicity of its message, paired with its simple composition, combine to create an icon of sculpture and graphic design. Although LOVE predates the Love Generation and flower children, Indiana captured the spirit of the 1960s in a word. When John Lennon, viewing an exhibition from this series commented that "all you need is love," he amplified Indiana's statement, transforming it into a hit Beatles anthem and oft-repeated refrain. Thus, with its easily-understood, universal message, presented in clear, streamlined graphics, LOVE became an instantly legible and visually compelling singularity. The "LOVE" works, including this sculpture, are perhaps Indiana's most significant in that they defined his career, bringing him to the attention of both the art world and the mainstream public. In 1965 he was commissioned to create a version of "LOVE" for what became the Museum of Modern Art's most popular and profitable Christmas card; in 1973 United States Postal Service released a stamp featuring the image to coincide with Valentine's Day. The image has become internationally famous; this is one of many large sculptures installed in public spaces around the world. The word has even been translated by the artist into the Hebrew "AHAVA" to create another version of the sculpture now installed in Jerusalem. "LOVE" has also been a source of distress for the artist in that, having failed to secure a copyright, the image has been marketed commercially on items such as clothing, mugs, and bags over which the artist has no control. Artwork description & Analysis: HOPE (2008) is a large-scale steel sculpture, created for the 2008 presidential campaign of Barack Obama, which plays on Indiana's most famous image, LOVE. Featuring the same compositional format of the iconic LOVE sculpture, Indiana stacks the first two letters of the word on top of its last two letters to form four equal parts. In addition to conveying a central message from Obama's campaign (which was also featured in Shepard Fairey's iconic poster), this arrangement (including the same tilted "O") evokes LOVE and binds together these two positive sentiments. Over the course of his six-decade career, Indiana has often felt compelled to make work with a strong social and political message. 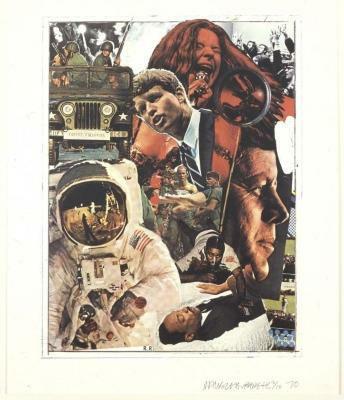 The first iteration of HOPE was a print, made to support Obama's campaign; all profits from the sale of this very successful image were donated to the Democratic National Campaign. Then, as was the case with LOVE, the concept of "HOPE" was transformed into an outdoor public sculpture. The first version was installed outside the Denver, Colorado building where the 2008 Democratic National Convention was being held. Since then, large-scale outdoor HOPE sculptures have appeared in public places, including Chicago and New York City. In a 2011 interview, Indiana explained that he wanted to "cover the earth with HOPE and bring hope to every country in the world." In this spirit, the first International Hope Day was celebrated in 2014, on his birthday, September 13. People all over the world were encouraged to spread the message of hope by visiting the sculptures, installed in different locations, and then circulating their images through social media. The universal appeal and popularity of the many iterations of Indiana's "HOPE" demonstrate his ability to harness fine art and popular culture to create icons of unity and inspiration. First published on 22 Jun 2016. Updated and modified regularly.